As the yearly calendar moves into December, you know what that means? 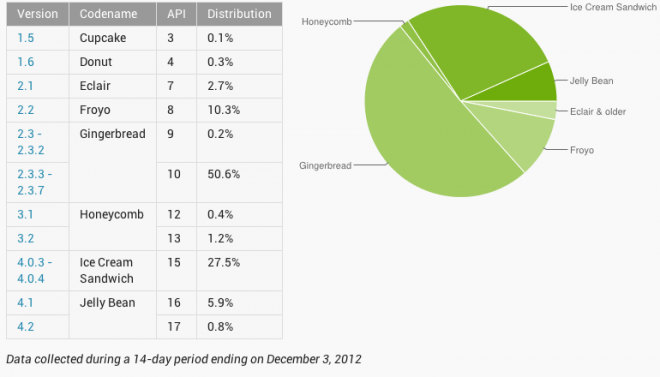 Google’s newest Android distribution chart is out with November numbers and we’re happy to see that Jelly Bean jumped from 2.7% to 6.7%. We can likely thank the release of the new Nexus devices, including the Nexus 4 and Nexus 10 for one of the largest one-month jumps we’ve seen from Android in recent memory. Jelly Bean wasn’t the only OS to see some growth however as Ice Cream Sandwich moved 2% from 25.8% to 27.5%. Android 3.0 Honeycomb declined down to 1.6% of all Android activations, with Android 2.3 Gingerbread still holding down the lions share with 50.6% of all Android devices. Cupcake, Donut, Eclair and Froyo still combine to make up 13.4% of Androids total market and we should just all admit there’s something seriously wrong with that number. However, those numbers are down from 15.5% combined from October, but there’s still plenty of room for improvement until we can get those numbers near or at zero. All these numbers combined lead to Androids total marketshare inside the US hovering around 53.6%, against Apple’s 34.3%. That’s a 1.4% increase for Android for the three months ending in October versus the 3 month average ending in July 2012 according to the newest Comscore report. Good news all around. There has to be a better way. When apple rolls out an update, it rolls out. Google releases updates to the Nexus devices, and it’s all good. Carriers are hurting the flow. You are forgetting that the manufacturers have a pivotal role in the middle of all that. The carriers don’t distribute the AOSP, each Android OS release has to be applied to dozens of different hardware builds by the manufacturers. The Nexus is the only equivalent of the iPhone, with hardware and OS controlled by the same entity. At least TM has them add some value by inserting WiFi calling as a function. Is that simply tardiness with distribution, or did Verizon somehow subvert the standard build? yet another reason I’ve grown to prefer GSM over CDMA. JBQ from Google team has explained this a long time ago. For those that aren’t familiar with open source projects. Everyone should contribute. CDMA radios being the technology that they are (just search for gsm vs cdma and you’ll find your answer). Basically the CDMA radios needs to be signed and distributed by the carrier. Anyways, that is basically what’s delaying the update. Verizon takes forever yo sign theirs for galaxy nexus. And the same happened for Sprint Nexus S.
Typical Android fanboy response. The real blame should go to Google for selling a device called the NEXUS on a carrier where they can’t update them. Not Verizon. I’m aware, but there has to be a better way. Time will tell whether the design changes that were incorporated into ICS to support device upgrades have been effective. There is said to be a significant and challenging upgrade path between GB and ICS which is probably responsible for the fact that over half the market is still stuck on GB…But there will always be the likelihood that devices are too old or hardware constrained to justify the resources required to update their OS. In short, it will never be possible for the Android ecosystem, in the hands of so many players, to be as streamlined as that of the iPhone. Carries don’t want that type of flow. They want the ‘Get a new phone every two years’ flow. How the hell are 2.7% of Android users still on Eclair, WTF? Several reasons, I imagine: devices deemed incapable of supporting the update to Froyo, devices that didn’t sell enough units to justify the time it would take to port them to Froyo, devices not updated by the user through ignorance or conscious choice, devices simply abandoned by the manufacturer or carrier. Not to mention those cheap $40 tablets you find at drug stores and discount stores. They were probably created originally when Eclair was still fresh, but didn’t sell. So, they re-label them Polaroid and sell them cheap. True. I had the Samsung Vibrant that I never did an official update to Froyo on, even though I used a custom ROM that was Froyo based. I gave that phone to my mother and she is still using it. It will never get updated past the custom ROM that she is running now as long as it stays in her hands. Even if I got it back, I wouldn’t bother trying to put another ROM on it now. Samsung did have froyo for the Vibrant, though it took almost a year after its initial release to push it out via Kies Mini in the midst of a public outcry. I know that it finally came out via Kies, but I had stopped using the Vibrant by then and saw no reason to update it to the official version of Froyo. Case on point, I bought a couple of years ago a Huawei Comet from TMobile for my mom. It makes and receive phone calls, download emails and text message. It’s on eclair and it works for her even now. So she’s one of the 2.7% out there. I’m pretty sure the Comet that I owned came with Froyo. I still have my T-Mobile G1 while waiting for Nexus 4 and Donut is the last official Android version for it. I installed unofficial Froyo but I can imaging a lot of people that don’t know about unofficial firmware. All the statistics given are for around half the mobile market, trending towards the future, market share will be decided by the groups who can push into whatever possible margin of the remaining 50% non-smartphone demographic. This is a demographic that might react better to cheaper devices. Good thing Steve Jobs is gone, this news would have killed him! Hopefully a chunk of guys with the galaxy s jumped on the N4 to increase the % of JB. Other than that, it’s a shame n el Google should do a better work to encourage manufacturers in push updates. 4.2 is still hella buggy. Randomly goes to home screen when using stock browser. Android users are so lucky to have these OS choices. I wish I could find an iPhone running iOS 4, or a PC running Windows XP.